The crowd may have been bigger at last night's (November 19) concert, but the energy was still every bit as palpable as it's been at any show A Tribe Called Red has done up to now. Master of spoken word and poetic politics Saul Williams opened the sold-out night at Victoria's Sugar Nightclub, his charged commentary hitting the rapt ears in the crowd like gunfire — not that the headliners really needed any introduction at this point. In just a few short years, A Tribe Called Red have gone from attracting small crowds made up of curious newcomers to creating a faithful following of diehards that buy out tickets, prompting additional shows to be added out of necessity. Their latest album, We Are the Halluci Nation, comes as a response to the larger and more diverse audience that the group has attracted as they continue to evolve and redefine themselves, and ATCR took the stage and welcomed that crowd with a brief excerpt from "We Are the Halluci Nation," featuring a vocal snippet from one of their idols, activist John Trudell. What started as a vehicle for dance parties has turned into something impossible to ignore ― an inclusive movement meant to inspire and elicit social change. And while the group's latest release is more nuanced and refined in its sound, their live shows encompasses all the grit, grime, sweat, and love that has gone into every release and tour they've ever put forth or embarked on. 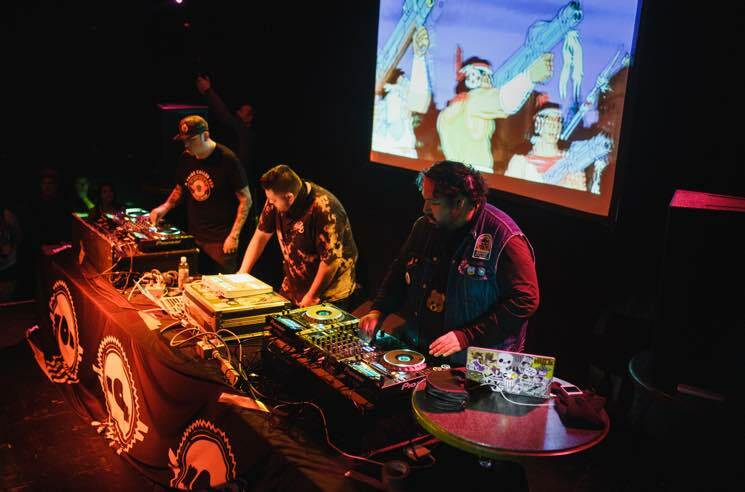 While they may be touring in support of their latest release, ATCR's vast catalogue and brilliant mash-ups still kept the show entirely unpredictable, and that spontaneity was embodied by the incredible First Nations performers that joined the trio onstage throughout the night. "Tribe Awards," "Electric Pow Wow Drum" and "Sisters" all saw one or two dancers join ATCR — whether in traditional dress doing traditional moves or throwing down as break dancers — giving additional strength and visibility to an already powerful force, and driving home the importance of A Tribe Called Red's music. Although their live shows allow for a bigger, meatier sound, the club environment didn't entirely do that sound justice; the swell of bass competing fiercely to the point of nearly muddling Tanya Tagaq's fiery throat singing on "Sila," but the song's low ends were lost on no one. It was a minor glitch that was easily smoothed over and followed up by the brilliant "R.E.D" featuring Yasiin Bey, Narcy, and Black Bear. Unsurprisingly, though, it was "Red Skin Girl" that garnered the biggest crowd response. Used to close out the set, two First Nations dancers made their way to the stage once more in full dress to accompany the final track, leaving one last powerful impression on those in attendance.